Tomi Harase adds his special touch to delicate chocolate creations, among other sweet and pretty treats. : You don’t really expect this type of fine dessert-making in a Newport-Mesa strip mall, but chef Tomi Harase, well-loved for his now-shuttered Café Blanc restaurants in Los Angeles, brings his Asian-French fusion concoctions to a high art. These dessert specialties are light as air and strikingly beautiful. Try one with an Italian espresso or cappuccino and it will make your day better. 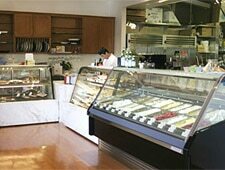 Some come here for two dozen creamy Italian-style gelatos in colorful seasonal fruit and decadent chocolate flavors.